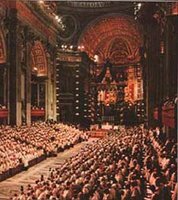 By tradition going back to early Christian times, the divine office is devised so that the whole course of the day and night is made holy by the praises of God. Therefore, when this wonderful song of praise is rightly performed by priests and others who are deputed for this purpose by the Church’s ordinance, or by the faithful praying together with the priest in the approved form, then it is truly the voice of the bride addressed to her bridegroom; it is the very prayer which Christ Himself, together with His body, addresses to the Father. The sacraments celebrate special experiences of grace: the Eucharist began as an observance of Christ’s Paschal Mystery on Sunday, the 8th day, the other six, moments of healing, of initiation, and of life’s vocation. Devotional life was pretty much all a grass roots effort trickling up to greater or lesser degrees of official recognition. The Liturgy of the Hours, however, has no other ambition than to follow the apostle’s prescription to pray always. The council bishops define it as Christ’s prayer to the Father, a prayer in which we mortals join. This entry was posted in Sacrosanctum Concilium. Bookmark the permalink.